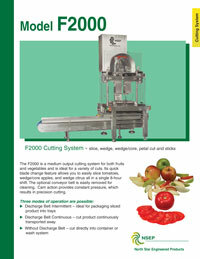 The F2000 is a medium output cutting system for both fruits and vegetables and is ideal for a variety of cuts. Its quick blade change feature allows you to easily slice tomatoes, wedge/core apples, and wedge citrus all in a single 8-hour shift. The optional conveyor belt is easily removed for cleaning. Cam action provides constant pressure, which results in precision cutting. 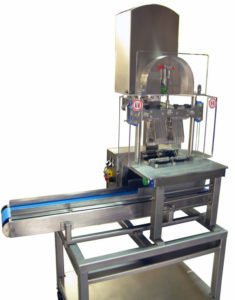 Discharge Belt Intermittent – ideal for packaging sliced product into trays. Discharge Belt Continuous – cut product continuously transported away. Without Discharge Belt – cut directly into container or wash system. Compact size fits most work environments - 1 or 2 meter conveyor lengths. Slicing – 3/16”, 1/4", 3/8”, 1/2"